Since Benjamin Netanyahu’s convincing re-election victory last week, the talk of adeepening breach between the US and Israel has escalated. But we should be highly skeptical that the administration of US President Barack Obama will take any serious steps that benefit Palestinian rights. Obama himself reiterated this criticism in an interview with The Huffington Post. Even in ostensibly criticizing Israel, Obama manages to heap undue praise on it. Of course Israeli “democracy” has nothing to do with equality: it is an ethnocracy founded on ethnic cleansing and the relentless subjugation of the remaining non-Jewish population. But what has most disturbed the US administration is Netanyahu’s avowal during the last days of the election campaign that he would never allow the creation of a Palestinian state on his watch. “We take him at his word when he said that it wouldn’t happen during his prime ministership, and so that’s why we’ve got to evaluate what other options are available to make sure that we don’t see a chaotic situation in the region,” Obama said. “We continue to believe that a two-state solution is the only way for the long-term security of Israel if it wants to stay both a Jewish state and democratic,” he added. “We’re gonna make sure, regardless of disagreements we have on policy that our military and intelligence cooperation to keep the Israeli people safe continues, and that cooperation also helps the American people stay safe,” the president said. While Obama has remained circumspect, his administration has sent up trial balloons through David Ignatius, a Washington Post columnist closely allied with the US administration. Drafting a new UN Security Council resolution outlining the framework for a Palestinian state. Such a resolution might summarize the parameters that emerged during Secretary of State John Kerry’s negotiations with Israelis and Palestinians that collapsed last year. Deterring Netanyahu’s plans to expand settlements in the West Bank, perhaps through warnings in a planned report to Congress on loan guarantees to Israel. President George H.W. Bush briefly cut off loan guarantees in 1991 to protest settlements, creating a political uproar but no lasting success in halting settlements. Altering current US policy that opposes Palestinian efforts to take complaints against Israel to the International Criminal Court. Similarly, the United States might relax its pressure against European allies that are advocating sanctions against Israel. Weighing future vetoes of UN Security Council resolutions condemning Israeli settlements or other activity. In the past, the United States’ use of the veto to support Israeli positions has been all but automatic. The first of these – a UN resolution – would cause excitement among those who may be impressed by the rare spectacle of a US president allowing the passage of a resolution even mildly critical of Israel. I do not oppose a UN resolution in principle, but I oppose one that would – like the one put forward by the Palestinian Authority last December – undermine fundamental Palestinian rights. Obama’s commitment to securing a “Jewish and democratic” Israel is wholly incompatible with Palestinian refugee rights and full equality for Palestinian citizens of Israel. (Also read Joseph Massad’s important article from December: “Recognizing Palestine, BDS and the survival of Israel”). In other words, these are mostly empty threats. But more than that all of them are minimal and mild. As noted, there’s nothing here about using the billions that the US gives to Israel every year as leverage – the no-strings-attached aid would presumably continue. The more promising possibility is that Obama could lessen his staunch opposition to Palestinians bringing Israeli war criminals to justice at the International Criminal Court. But again, if Obama were serious, the first step he would take is to halt the supplies of weapons that are used to occupy and murder Palestinians. We must not forget that at the height of Israel’s massacre in Gaza last summer, the Obama administration opened its weapons stores to the Israeli military, resupplying it with bombs and grenades of the kind that were causing indiscriminate casualties among Palestinian civilians. No UN resolutions are needed for that. Obama has executive authority to act. Moreover, a real sign of seriousness would be if the Obama administration were to open an investigation into Israel’s use of US weapons to commit human rights crimes. The State Department has a mandate to do this under the 1976 Arms Export Control Act but has refused to fulfill it. It is late in Obama’s term for him to be considering minimal actions against Israel and to expect them to have any real impact on its rogue behavior. Obama must know that even if he took all the measures being floated they would generate much political heat and backlash, while doing little to bring about a “two-state solution” on his watch. 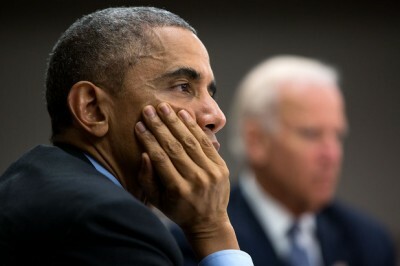 But that backlash could further jeopardize his chances of getting a potential deal with Iran through Congress. So expect him to do little or nothing. To be sure, as I and others have argued, Netanyahu’s re-election presents an important opportunity for Palestinians as it widens the cracks between Israel and the rest of the world.